Management major launches local branch of national Imagination Library reading program. It's a long way from Virginia to the islands of Hawaii, but Christopher Newport was never far from Kyle DeGood's heart. DeGood, a junior management major, was born in Yorktown but moved to Honolulu as a child when his military family was transferred there. When his parents were later assigned back to Virginia, it was a dream come true. "CNU has always been my dream school," he says. "It's where I always wanted to be. I've seen the campus change through the years and all the wonderful things that have been done." DeGood's passion for business led him to the Luter School of Business, where he met management professor Willy Donaldson. "Dr. Donaldson is an incredible entrepreneur and business person, has taken a company public and been involved in so many different organizations," DeGood says. "He's very personable, and our personalities kind of bounce off each other. I'm really blessed he's my mentor." As DeGood's business acumen grew, he began to look for ways he could also feed his passion for helping others. He hit upon Christopher Newport's minor in civic engagement and social entrepreneurship, an interdisciplinary blend of study and service. He launched his own nonprofit venture, the DeGood Foundation, which develops programs for youth health education and literacy. The signature initiative is a partnership with the Imagination Library, the global child literacy endeavor founded by Dolly Parton. As DeGood – an avid Parton fan – explains, "it's a book-gifting program where children get a free book in the mail every month from the time they're born until they start kindergarten." The books are specifically curated to match critical developmental stages, and cover themes like love, kindness, shapes, colors, numbers and animals. "Reading is the ultimate foundation for education," DeGood says. "And for newborns up to age five, it's when the most neurological connections are made in the brain." DeGood hit upon the idea for the Imagination Library one night while reading to his young sisters. "They kept bringing me all these different books to read, and then fell asleep!" DeGood recalls. "I was just reading to myself at that point, watching them sleep, and thinking about what I could do to help them as they got older. I thought, 'maybe this is what you're meant to do – help them learn to read. It was kind of more of a calling." 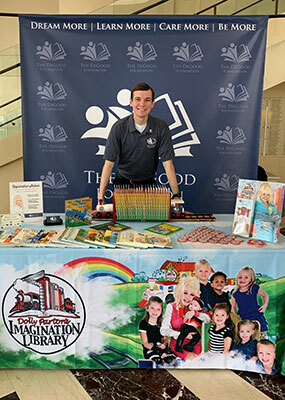 The DeGood Foundation launched the local Imagination Library operation in March with a kickoff event at the Ferguson Center for the Arts. They market the program – and pay for the books – which they do with fundraisers and via grants from state agencies and other literacy advocacy groups. The national organization acquires the books from publishers and ships them to members. "Right now we're serving about 1,500 children a month, just in two zip codes – 23606 and 23692," DeGood says. "In 10 years I foresee us at least covering all Newport News and all of Yorktown with the program." DeGood's ambitions for the program don't stop there. "Hopefully we'll cover the entire Peninsula, and my ultimate goal – major big dream – is to take it statewide and get all of Virginia's children access to the Imagination Library so they can have access to all the best possible resources for their education." As for why he chose this path rather than a strictly commercial focus for his business career, DeGood has a ready answer." That's always been my personality, to do something, either to give or just to be kind or put a smile on someone's face." For information on how to enroll in the Imagination Library, and more about the DeGood Foundation's many other plans and initiatives, click the link below.